New York: In its final days before descending into bankruptcy, Jon Corzine’s MF Global Holdings may have transferred customer funds to avoid detection by authorities, a regulator of the firm said on Wednesday. A source familiar with the matter told Reuters that regulators are still not sure where the money is, and why they can’t find it. CME Group, the biggest US futures exchange operator, said a transfer of funds from customer accounts at MF Global appeared to occur after a CME audit of the funds last week, which would be in violation of CFTC regulations and CME rules. “It now appears that the firm made subsequent transfers of customer segregated funds in a manner that may have been designed to avoid detection," said the CME, one of MF Global’s regulators. US regulators started raising concerns about MF Global’s European sovereign debt exposure as early as June, according to a source familiar with the matter, some four months before the company’s collapse. While the event hit volumes in the commodities market earlier in the week, bankruptcy court proceedings on Wednesday offered hope that customers would be able to trade again by the end of the week as their positions and much of their collateral were transferred to other brokers. As for the broader economic implications, US Federal Reserve chairman Ben Bernanke said they are limited. “It appears to be an idiosyncratic case," Bernanke told reporters. “We are monitoring the possible impacts on funding markets and elsewhere, and so far we have not seen any significant impact on financial stability." But the meltdown of Jon Corzine’s firm should spark reforms to separate retail from investment banking operations, according to “Bond King" Bill Gross, who says it marks another example of how Wall Street has “lost its way." “Do we have a better example today than MF Global in terms of the mingling of those two particular aspects of capital allocation?" Gross, who runs the $242.2 billion PIMCO Total Return portfolio, said at a Charles Schwab Corp conference in San Francisco. “So the closer we get back to separating the two, I suppose the better from the standpoint of reform." Not long ago, Wall Street was witnessing the comeback of Corzine, the ex-Goldman Sachs chief and former New Jersey senator and governor, when he took the helm of MF Global. But the recent revelation of $6.3 billion of European bond positions caused the ratings agencies to cut MF Global’s debt to junk status, speeding its descent into bankruptcy. Though the firm’s failure played out in a matter of days, regulators started turning the screws on MF Global months ago. FINRA felt that regardless of GAAP accounting, MF Global should recognize how much the market value of the sovereign debt-related holdings had declined, and consulted with the US Securities and Exchange Commission, the source said. After lengthy conversations with FINRA and the SEC, MF Global yielded and infused the additional capital called for, something the firm disclosed on 1 September. The European debt trades pushed the company into bankruptcy, but the heat on MF Global now is why it cannot account for a large amount of customer money that was supposed to be kept separate from other funds, sources said. Regulators are trying to determine if the brokerage used some of the money to support its own trades. The CFTC has not decided whether it is going to launch a formal probe into MF Global, but it remains an option the agency could consider, a source told Reuters. The agency typically does not announce when it starts an investigation. “We don’t want people to leap to any kind of conclusion that there is something criminal here, and we don’t know that," the source said. The focus turned to bankruptcy court late in the day, where the trustee in charge of liquidating the brokerage said 150,000 customer accounts had been frozen. The CFTC added that it has found a handful of players willing to pick up MF accounts, including ABN Amro Chicago Clearing, ADM Investor Services, Dorman Trading, FCStone, R.J. O’Brien and/or Rosenthal Collins Group. One piece of good news for MF Global on the money front came from IntercontinentalExchange Inc, one of the world’s largest exchange and clearinghouse operators. 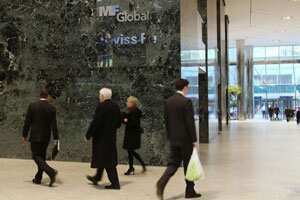 It said Wednesday that it received all of the margin money it required from MF Global and its customers.